On a recent Saturday afternoon my kids were getting antsy, and as we watched the temperatures remain far below freezing, they turned to the bookshelf to see if they could find anything interesting. Before I knew it, my Randallstown High School yearbook was placed in my lap and they asked me to tell them about my days in high school. As I thought about high school, I was so sure that I was different. That as I opened that yearbook, I’d see how much I had changed since that year. But as I started to read through my senior summary, I realized how much I really am the same person that was captured on paper 24 years prior. Teaching: As my website advertises “mentoring,” my high school yearbook lists me as a peer tutor in 10th, 11th and 12th grade. Writing: As I now enjoy writing as part of my job, be it the book, articles about user experience, blog posts, and reports on research findings, in 10th grade I was writing for the Ram’s Horn school newspaper, and in 12th grade I was both a writer and editor for Genesis, the high school literary magazine. I then went and found something I had written for the literary magazine, a poem that I did not remember ever writing. Value of Community: Some of my recent articles, as well as the book, talk about the critical importance of not only networking but of being a part of the user experience community. 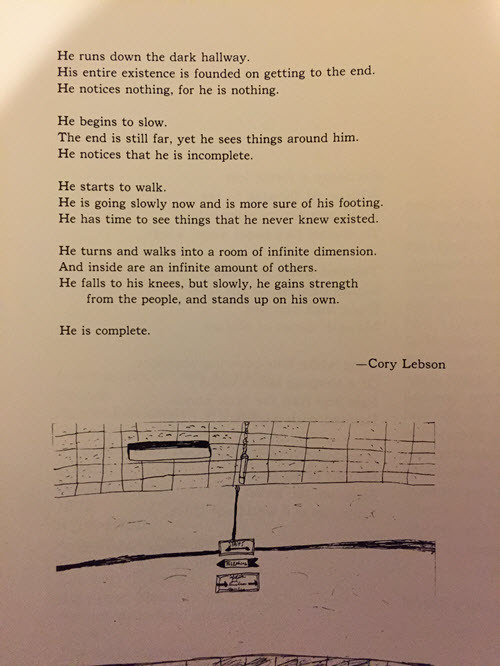 The poem talks about a boy that is so focused on end goals that he doesn’t see what is around him, but when he stops and looks around, he sees other people and gains strength from them to be complete. Research: By 12th grade, I had discovered a love of research so I joined the science club. While I could never have anticipated back then that I’d be doing the kinds of research that I’m doing now, it’s still interesting for me to see this core aspect of a future profession. Believing: Most interesting of all to me was seeing my chosen quote: “Some things have to be believed to be seen.” While this has been shortened over the years, sitting on my Facebook profile banner is “Believing is seeing,” which has remained my mantra through the years and is the way that I have lived my life and focused my career. That is, you have to envision something first – and maintain a focus on that vision – in order to see it happen. As I looked at this snapshot of myself captured in words, I found it satisfying to see how I had unknowingly channeled the core interests of that 17 year old – who had no definitive idea where life would go personally or professionally – into the person I am today. I think now about my own three children, the oldest one of them already in high school. I see one who is phenomenally artistic and creative while managing to be amazingly organized. I see one who is super-intellectual, absorbs math concepts, and can make lawyer-like arguments as she presents her case or defends her sisters to her misinformed parents. And I see one who has the most phenomenal ability to understand and use language combined with an incredible emotional IQ. What will they become? Who will they be? I’m sure that I’m seeing pieces of their future selves, but I know that I need to wait many more years to see which of those pieces come together and in what way. Keep sight of who you were in order to better understand who you are today. You don’t need to wait over 20 years like I did to look back and meet yourself from days past. While you may remember a totally different person in those years – and certainly you have grown and evolved over time – when you look at the evidence, you may also be able to find clear signs of who you later became – and it is satisfying to see how, at the core, you are still you.